I didn't get a chance to email earlier, but wanted to send an email letting you know how happy I was with the cleaning service I received 11/ 24 . The 2 ladies that came did a fantastic job - the best cleaning I've had from a company. I actually felt bad, because they did our master bedroom, even though I had not included it in the quote and had the door closed so they wouldn't bother. We tend to store things in there when we have had people clean in the past. So there was A LOT of stuff on the floor, which they proceeded to move onto the bed to so they could clean. While they didn't have to clean it, it was great to see it so clean!!! The whole upstairs looked fantastic! I left an excellent review on Angie's List, and I hope we can continue to do business!!! Thank you so much. I've tried to find a time when my husband wasn't around to talk to you - but that hasn't happened. He lost his job a year ago and until he finds work and we are back to normal, I have to discontinue house cleaning services. You have done a wonderful job all these years. Thank you so much. 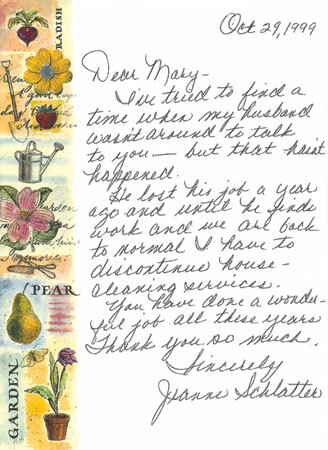 When my beloved brother Michael became ill and needed help with the housework in his Barrington Hills home, we called Maria's Cleaning Service and I will always be glad that we did. Maria matched just the right person to Michael's needs. Because of the unpredictability of his health, this company's dedication and flexibility became very important in my ability to take care of my brother. When he passed away, they helped me with the house during his final services, and helped me keep it prepared for sale. I can't speak highly enough of this company. Maria went out of her way to help us in our time of need. Anyone considering a different cleaning service is just plain crazy.